Before dawn on the morning of January 23rd 2009 I made my very first observation of comet C/2007 N3 Lulin. The reward took a long time in coming because I had been up before the Sun every single morning for several weeks in the hope of making an early observation of this exciting comet. However, due to clouds, severe air frosts, and dense fog the comet alluded me during this period. This morning I woke up just after 05.00 UT to a great clear sky. It was very cold and frosty with slippery ice on the ground but the sky was in good shape. I grabbed by camera, tripod, and 10x50mm binoculars (B50) and got prepared to track down the comet. Lulin was too low in the sky to see from home so I had to walk up to a hill which was several hundreds metres away. I glanced into the east and saw the bright stars of Scorpius and Libra. I spent 15 min's scanning with B50 without success and came to the conclusion that I really needed something more powerful for a proper look. I decided to go back home and get the 8.5" F/7 dobsonian reflector but due to its weight I had to lift it in two sections. This involved four trips to get the rocker box and tube to my comet hunting location. After I took a few min's to catch my breath I checked that the telrad was aligned then guided the scope into western Scorpius. I began a series of vertical sweeps while gradually working my way S into Libra. After a few min's I found Lulin a few degrees below 38 Librae at 05.29 UT. This was my first new comet observation of 2009 and the 48th comet I have hunted down since I began many years ago so I was delighted!. I observed the comet for 30 min's in the frigid conditions then brought the scope back home again which involved four more trips. When I entered the my back garden I realized that the comet was actually visible just above my fence in the SE so my previous trip was in vain. I got comfortable and began to study Lulin in comfort. My immediate impression was that the comet was very bright. It struck me just how healthy and active the coma looked even at a casual glance. The coma was at least 7' in dia with a very intense white-coloured and disk-shaped central condensation with star-like false nucleus at centre. The outer coma was an obvious green colour. On several occasions I seen at least one jet within the coma pointing to the S. The anti-tail was very faint and elusive and required good dark adaption and averted vision. I noticed that it didn't point directly towards the Sun but slightly to the W of S which is something I have not seen on images or in other reports. By this stage the background sky in the FOV was grey and hazy. I had to move the scope in various directions to pick out the faint details so I'm not 100% certain about what I saw. I found the colourless anti-tail to be at least 20' long but I suspected it to be much longer. The gas/ion tail was much brighter and pointed in a generally S direction. To me this tail was green and sported a smooth profile and seemed to broaden with distance away from the coma much like a search beam. I could easily see the tail for a minimum of 1 degree but again I'm sure it's much longer that this. Seeing both tails at the same time was quite a treat! Despite the very poor quality of my binoculars I was still able to find the comet easily. I also tried very carefully to detect it with the naked eye but I just couldn't convince myself that it was visible. However, I suspect that with excellent sky conditions the first naked eye observations will be reported very soon. As for a magnitude estimate, I didn't really make one because I was trying to ferret out the details within the tail but based on the ease of which I could see the coma in the scope I would say approx mag +6.5, give or take a mag or so on either side. I think this comet could very well put on a good show in Feb as along as it continues to brighten. I will be watching Lulin every clear morning for now on. I ended the night with a mug of tea and watched the twilight arch grow. 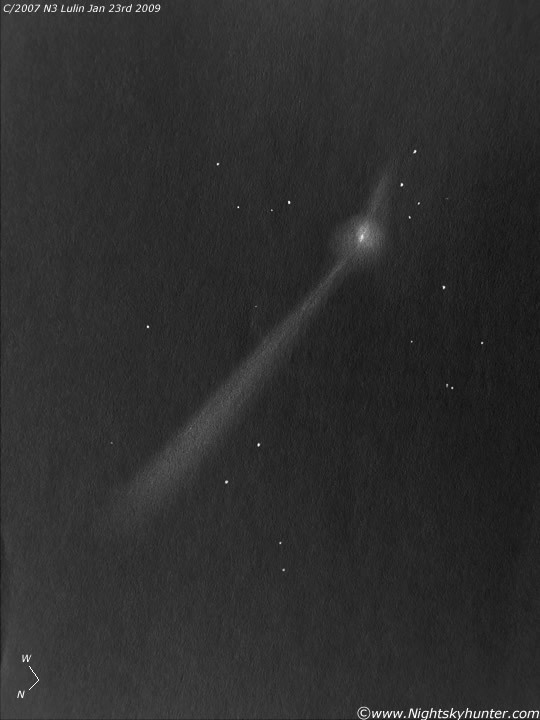 It was 07.15 UT before I finally left the comet alone to continue it's journey towards Earth.